Granite. Quartz. Solid surface. Everyone needs options, especially when picking out kitchen countertops. Sears Home Services has just the right countertop to beautify your kitchen, no matter what style you prefer. We bring the showroom to you by walking you through our wide selection of countertops, right in the comfort of your home. Our specially-trained consultant can help you choose the perfect style to complement the look of your kitchen. 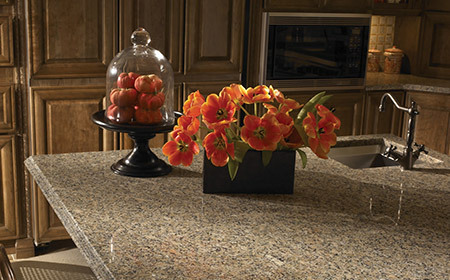 Granite is the most popular choice among our customers, and for good reason. Imagine having a gorgeous countertop installed in your kitchen, knowing that no one else will have exactly the same look. That’s because granite is a natural stone that varies in color and pattern from slab to slab. Granite countertops are also very sturdy and resistant to chemicals. And when you buy your granite countertops from Sears, you’ll know they are GREENGUARD® certified. Solid Surface countertops are completely non-porous, making them solid the whole way through. That means they are extremely easy to clean and resistant to mold. It also means they won’t absorb food, odors, or bacteria. Our wide selection of solid surface styles and colors make them easy to match the look of your kitchen, regardless of its style. They also easily integrate with sinks and coved backsplashes. Quartz countertops can be very beautiful. But there’s more to Quartz than its good looks. It’s stain-resistant, scorch-resistant, and scratch-resistant. Only diamonds, sapphires, and topaz have harder surfaces. And its non-porous surface makes it so easy to clean, it’s virtually maintenance-free. Any addition to your kitchen is an important investment. Trust the company that’s been around for 125 years to provide you quality countertops at the right price. We’ll give you a free in-home estimate before you agree to having any work done. And our project consultants will make sure that your countertops are installed right the first time. Trust Sears Home Services with your next countertop purchase. Save $250 on countertop only purchases of $1,500 or more. Offer valid through 5/4/2019. Not valid on prior sales or in combination with any other offer. Purchase requirement before taxes and after other discounts and must be made in a single transaction.